Product prices and availability are accurate as of 2019-04-15 22:07:02 UTC and are subject to change. Any price and availability information displayed on http://www.amazon.co.uk/ at the time of purchase will apply to the purchase of this product. 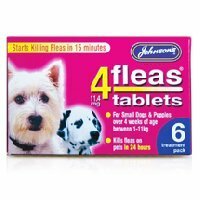 Johnsons flea tablets are the most effective method for getting rid of fleas on your pet almost instantly. These tablets start to kill fleas within 15 minutes of your pet taking them. All fleas will be dead within 24 hours. This box contains 6 tablets and the dosage is one tablet per dog.